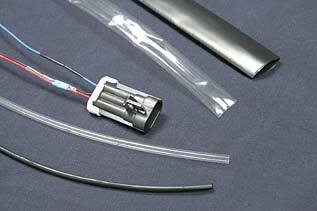 We carry a selection of special-purpose heat-shrinkable tubing for various industrial applications. BD327 is a flame retardant, flexible tubing offering a high degree of mechanical strength and high temperature resistance. Fluoropolymer is made from polyvinylidene fluoride which gives outstanding abrasion resistance and cut-through properties. BD327 is inherently flame-retardant and flexible. It is highly resistant to most industrial fuels, chemicals and solvents. Fluoropolymer tubings shrink at 125°C on applications such as jacketing for components, fuse coverings and capacitor protection. Because the tubing is transparent, it offers excellent see-thru inspection and identification. BD390 is a heat shrinkable, flame retarded, elastomer tubing specially formulated for long term resistance to fluids, heat and mechanical abuse. Recommended for protecting cables and wire harnesses on military ground vehicles and is used in a variety of applications requiring ruggedness and fluid resistance. BD390 remains flexible at low temperatures which makes it ideal for cables and harness applications that operate in severe environmental conditions.